I've read all of your articles about the ASU formula but don't know where to purchase your updated formula because you don't give it a name. Please let me know where I can get it. Thank you. My husband suffered an aggressive and rare type lymphoma in the hip bone. He has been in remission for 2 years now. Due to this event his hip cartilage was eliminated - bone to bone - due to other health issues Hep C (low platelet) - hip replacement surgery has been postponed. 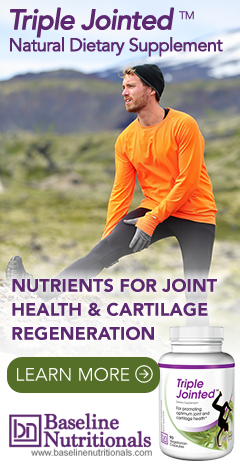 I have been told, there is nothing to regenerate cartilage when is gone. But I will keep asking... His pain and inflammation worsen every day. Do you have any suggestion? I looked in the products related to Joint Enhancers, but I couldn't find the one that has in it the ASU. I did not see any solutions for heavy mycoplama infections that cause inflammation and connective tissue issues. I don't want to go the heavy antibiotic route. I'm intrigued. I've suffered with chronic joint pain to the point of left hip, and both knees being replaced. I feel I'm fast approaching a right hip replacement along with degenerative back problems as well. I'm looking forward to trying this out with hope of a brighter future. I have read about CMO before and it sound like a really interesting ingredient. I would very much like to try it, however I'm currently taking Rapamune- an immune suppressant - following the rejection of my corneal transplants. I spoke to my ophthalmologist about it but he's never heard of CMO and cautioned me against it. I suffer from chronic hip pain (more so since I've been taking the immune suppressant). My question is- are there any contra-indications for taking CMO whilst on an immune suppressant? My thinking was that the CMO would not only assist in the joint pain but may also arrest the T-lymphocytes that are attacking the foreign corneal tissue thus allowing me to reduce the dose of this ghastly medication I need to take. Being that this formulation has been shown to be beneficial for certain auto-immune diseases such as rheumatoid arthritis, is there any anecdotal or clinical evidence to suggest that other auto-immune disorders in particular, those suffering from Raynaud's Syndrome might experience some relief? We have not heard from anyone using this formula with Raynaud's Syndrome. If you try it, you will be the first and will be able to share your experience. And I no longer care what goodies anyone says is in soy. There's no way I'll ever willingly knowingly take any soy again, knowing what I do now about the proper way to consume it (fermented, small doses, condiment, organic), and how the vast majority (>99% iirc) is produced (monsanto's genetically engineered to tolerate greater saturation in poisonous pesticides). But the rest of that... does sound worth giving a go to help deal with raynauds. As easy as this is to say on a hot day in summer, I think I've got my raynauds mostly under control now, using a combination of thermogenic herbs n spices, various insights and practices from ayurveda and the gerson protocol, and many important vitamins (B vitamins most especially, specifically inositol hexaniacinate, and methylcobalamin), and of course, ginkgo biloba. I've yet to put this to the test also, but I have a growing suspicion that nightshades (and aliums) may also be to blame for worsening raynauds (and other autoimmune disorders), though I bear in mind that's quite a broad brush to paint with, so to speak, and that there may well be exceptions... like ashvagandha, which seems to have some very nice adaptogenic and other beneficial properties. I thought I should add that in case it's of benefit to those with arthirits too, or even to other raynauds sufferers who found their way here through a websearch thanks to those last two comments.